Enjoy a ride in one of the Horse and Buggy Rides in downtown Helen Georgia. We can arrange pickup at your condo and drop off for any occasion you may have. Pack the �Kids� up for a trip to the new BabyLand General� Hospital in Cleveland, Georgia, voted one of the Travel Channel�s Top Ten Toylands. Beautifully situated on 650 acres in the North Georgia Mountains, this Southern Style home filled with Cabbage Patch Kids will capture the imagination of your entire family. ADMISSION IS FREE. At Nacoochee Adventures we offer more than just an outdoor adventure - we also incorporate the history of North Georgia, both in general and specifically related to the Nacoochee Valley. From the Native American inhabitants, to the gold rush, to the moonshine makers - this region is home to a rich and varied history. Get to know our guides and let them take you on a trip through time as we visit each of these periods of history. We have offered fun family outings on the Chattahoochee River Since 1972. Our staff can help you select a trip that is right for you. Whether you require a leisure float down the river in a raft while you get some sun, or a workout running the rapids. 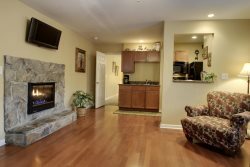 We can make your stay in the North Georgia Mountains a trip to remember. Our zipline course has two aerial bridges and four lines. It will take you soaring over the Chattahoochee River. Our 24` climbing wall has four lanes and is a challenge for every skill level. The big adventure course has eleven elements and a short zip line. The smaller adventure course has five elements and a short zip line. When the river is low, the Water Park is the place to be: we have 4 large waterslides and a 1000` lazy river with controlled water, which means you don`t get stuck ever! NO ROCKS, NO WALKING, NO SNAKES, NO WORRIES! Enjoy visiting with hundreds of animals! Visit with new babies and meet some famous animals! Have fun feeding a variety or rare, mini, and unique farm animals. Join us for our new improved Wildlife Walks. A hands on experience you won`t forget !! Most popular is the Camel encounter! Join us for our ride through the zoo to view animals such as camels, zebras, water buffalo and more. Pony rides and bottle feeding are always a favorite with the kids! Visit us this year for your family adventure! It�s affordable nature based fun for ages 13 to 60+. Woody�s Mountain Bikes typical trail ride/rental package includes bicycle, helmet & shuttle, and can last 2 hours or all day. Treat yourself and your family to some natural sightseeing in Georgia�s Chattahoochee National Forest. Pack a picnic, bring your camera, and enjoy waterfalls along the way. Small groups, large groups, corporate groups, youth groups, church groups, everyone is welcome. Enjoy some of the most delicious and irresistible gourmet chocolates in the world! Each piece is delicately hand-crafted and perfected for your satisfaction. We are located in the mountains in a quaint German tourist town...right in the heart of Alpine Helen, Georgia. We are a serious manufacturer of a huge variety of sensational treats to tempt any chocolate or sweet lover. Established in 1876, ?Nora Mill Granary is an operational gristmill sitting alongside the Chattahoochee River in the foothills of the North Georgia Mountains. At Nora Mill, we utilize the original 1,500 pound French Burr Stones to grind and produce all kind of corn and wheat based products such as grits, cornmeal, pancake & waffle mixes, flours, biscuit & bread mixes, pioneer`s porridge, and the like. In addition, we have an old-fashioned country store & gift shop that we have named "Nora Mill Next Door." Our country store is stocked with thousands of new items and even has a large kitchen built just for cooking & serving samples of our mill & store products. Escape Rooms of Helen GA will go out of their way to challenge you. Their team of designers and game masters have created a selection of rooms perfect for families, friends, tourists, co-workers and for special events.